Author & historian Amy Knight discusses her book "Orders to Kill: The Putin Regime and Political Murder"
Author, historian and MSNBC expert guest Amy Knight to speak on her latest book, Orders to Kill: the Putin Regime and Political Murder with one half hour afterwards for questions. Amy W. Knight is an American historian of the Soviet Union and Russia. She has been described by The New York Times as "the West's foremost scholar" of the KGB. She has written over 30 scholarly articles and has contributed numerous pieces on Russian politics and history to the New York Review of Books and the Times Literary Supplement. Her articles have also been published in the New York Times, the Washington Post and, most recently, the Daily Beast. 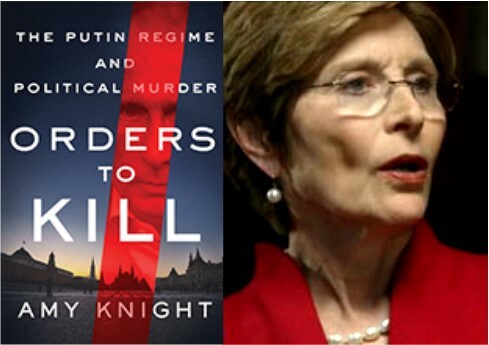 Amy Knight's new book Orders to Kill: the Putin Regime and Political Murder, appeared in September 2017. Amy’s previous books include How the Cold War Began: the Igor Gouzenko Affair and the Hunt for Soviet Spies, Who Killed Kirov? The Kremlin’s Greatest Mystery, Spies Without Cloaks: The KGB’s Successors, Beria: Stalin’s First Lieutenant, and The KGB: Police and Politics in the Soviet Union.